The book aim is to define the Internet of Things (IoT) in a global view, present the research agenda for Internet of Things technologies by addressing the new technological developments and providing a global balanced coverage of the challenges and the technical and industrial trends. Energy consumption by the data, communication and networking devices and global CO2 emission is increasing exponentially. ICT has a dual role in this process: it accounts for about two percent of global CO2 emissions and at the same the ICT including IoT technologies and applications have a direct effect on lowering CO2 emissions, increasing energy efficiency, reducing power consumption, and achieving efficient waste recycling. IoT together with the other emerging Internet developments such as Internet of Energy, Media, People, Services, Business/Enterprises are the backbone of the digital economy, the digital society and the foundation for the future knowledge based economy and innovation society. IoT developments show that we will have 16 billion connected devices by the year 2020 , which will average out to six devices per person on earth and to many more per person in digital societies. Devices like smart phones and machine to machine or thing to thing communication will be the main drivers for further IoT development. The first direct consequence of the IoT is the generation of huge quantities of data, where every physical or virtual object may have a digital twin in the cloud, which could be generating regular updates. The IoT contribution is in the increased value of information created by the number of interconnections among things and the transformation of the processed information into knowledge for the benefit of mankind and society. The Internet of Things market is connected to industrial machine to machine (M2M) systems, smart meters and enabling technologies such as nanoelectronics, communications, sensors, smart phones, embedded systems, cloud computing and software technologies that will create new products, new services, new interfaces by creating smart environments and smart spaces with applications ranging from smart transport, cities, buildings, energy, grid, to smart health and life. 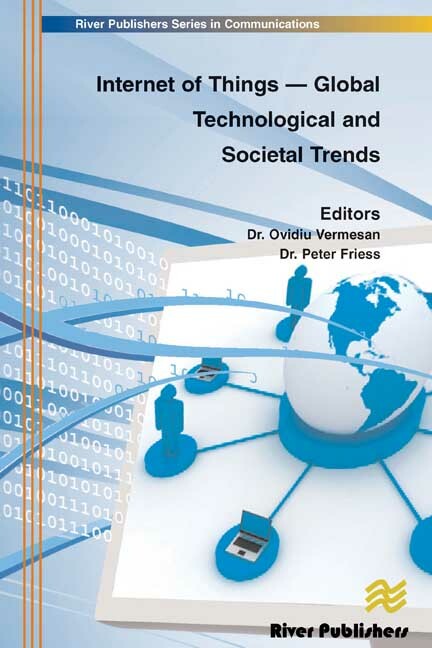 "Internet of Things - from Ubiquitous Computing to Ubiquitous Intelligence Applications"
Internet of Things Global Technological and Societal Trends Smart Environments and Spaces to Green ICT by Ovidiu Vermesan and Peter Friess I have an interest in the Internet of things both from a business perspective but also from a PhD / research perspective. I have covered IOT before for ex How would the Internet of things look like if it were driven by NFC (vs RFID). Hence, I was interested in the book and the publishers kindly sent me a complimentary copy for review. Chapter 9 Opportunities and challenges for IOT technologies is a long chapter about technologies and future challenges like security, privacy etc. Again, this could be a whole book! Thus, there is a lot of value which the book brings My only suggestion would be that perhaps that the editors could have provided greater editorial across the papers � ex their view on China, Japan etc. Since each of the authors are also well respected, readers get value from the specific chapters but maybe there could be more across the chapters. Also, I could not find any emphasis on �Green ICT� although the title suggests that. In any case, if you have a commercial/ research interest in this space, I would recommend it.